Just like Qore, FirstPlay brings HD reviews, previews and game footage (among other things) to gamers living in Europe. 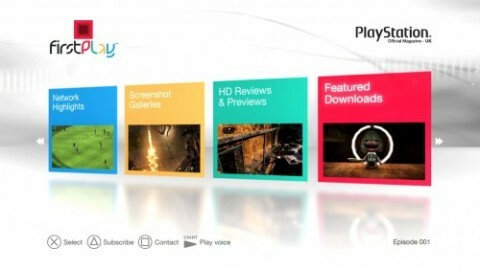 FirstPlay also contains shortcuts to exclusive PlayStation Store content available only to FirstPlay customers. FirstPlay’s bespoke content is created by a hand-picked team of TV and gaming veterans with the reviews and previews coming from the team behind the respected Official PlayStation Magazine. FirstPlay is supported by advertising so you can expect to see pre- and post-roll advertising. Having spent just under a hour watching the first episode we can tell you that each episode has four main sections (described in detail below). Upon loading up the episode, you are greeted with a friendly female voice giving you a quick overview about FirstPlay. There are various shortcuts on the main menu, such as pressing to contact the FirstPlay team via the PlayStation Network and to subscribe (this feature didn’t work in the beta). The Reviews and Preview section contains videos on various titles and Blu-ray movies. In the beta episode, Battlefield: Bad Company 2 is reviewed and previews of Lost Planet 2 and Super Street Fighter IV are included too. There is also a brief review of the Blu-ray title Cracks. The reviews and previews are voiced over by the female voice you heard earlier on. Up on laying the first review we were presented with an advert for Assassin’s Creed II, followed by the review itself. The reviews are humorous and includes everything you want to know about the game, covering the story, gameplay, graphics, and verdict. The reviews include comparisons to similar titles, complete with game footage, and comments from developers where appropriate. The Battlefield: Bad Company 2 review includes comparisons with Modern Warfare 2 and Red Faction: Guerrilla. When we started playing a preview of Lost Planet 2 we were presented with another advert (this time of Mythbusters) before the preview started. The previews are equally detailed covering all the necessities of upcoming games complete with footage of the game. The screenshoot galleries section contain various images and concept art for upcoming games. The beta episode contains screens of Brink, Mafia II, Red Dead Redemption and 2010 FIFA World Cup. The galleries vary in size from a few photos to over 20, include a mix up of in-game screens, cut-scenes and concept art. The galleries are voiced-over with some brief information about each screen. You can use the controller to navigate between images, for example using the L1 and R1 triggers to go back and forward in the gallery. The analogue sticks can be used to zoom in/out and move around the image. Some images can even be saved to the hard drive and used as wallpaper using the button. This section features videos and short clips related to the PlayStation Network. In the beta episode, you can find the Top 10 user-uploaded SingStar videos, a round-up of movies and games on the PlayStation Video Store, and a closer look at some Minis titles. Once again the videos have voice-over from the same female as before. Come videos have shortcut links to the official website, for example, pressing the SELECT button on the SingStar clip takes you to the official website. Even pressing SELECT on an advert takes you to the associated product page. Finally, the Featured Downloads section is where you will find exclusive downloadable content, demos and more. Just like Qore, FirstPlay will include access to betas, early access to playable demos and various exclusive content such as free dynamic themes, static themes and the occasional wallpaper or two. The beta episode features playable demos of Crash Commando, LittleBigPlanet and Savage Moon. As for DLC, you can download the EyePet: Lucky Dip Styling Pack. Clicking on any of the options exits FirstPlay and launches the PlayStation Store with the correct download page loaded up. Exiting the store (with ) returns you to FirstPlay, and right where you left off too. The quality of the content is high and at 720p you get a perfect glimpse of what future games will look like on your HDTV. The beta episode was 1156MB in size, which is a considerable amount to download, and even more so as a new episode will be out every week. Although the episodes will contain a number of adverts, you can always skip them using the button. Each episode is definitely value for money, costing only 99p each. You even save a few quid if you subscribe for a whole quarter. If you are a subscriber of the PlayStation Magazine, you can easily replace the traditional magazine with this interactive version – it even works out to be a bit cheaper (£5.99/month for the magazine vs £3.96 for four episodes) with the added bonus of no reading necessary.